Last year, despite a trio of performances that were all worthy of awards recognition, Ryan Gosling didn't get one single Academy Awards nomination for this work in Crazy, Stupid Love, Drive, or The Ides of March, my favorite film from 2011. But with turns in films like Lawless from Terrence Malick, The Place Beyond the Pines from Blue Valentine director Derek Cianfrance and Only God Forgives from Drive director Nicolas Winding Refn coming soon, he's not slowing down at all. 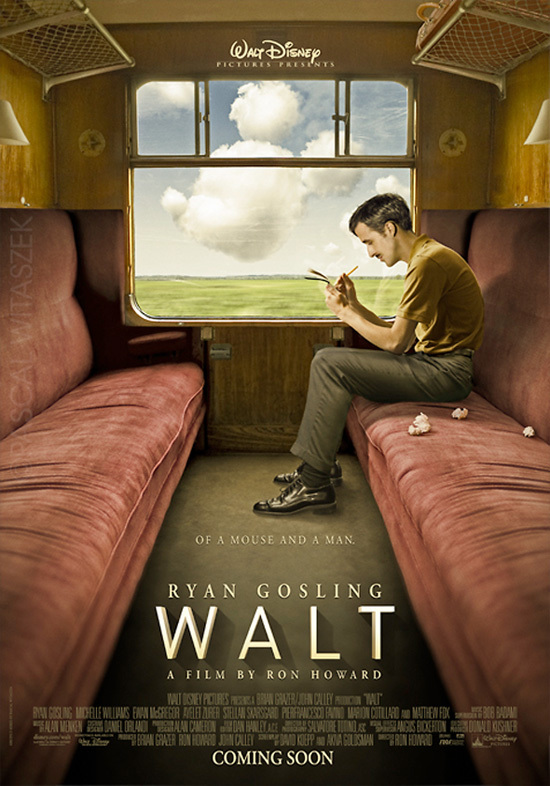 Now we get a look at Gosling in a film we may never see in a fan-made poster for a hypothetical Walt Disney biopic from Ron Howard. Remember, this in no way represents a real project or even hints at the fact that Ron Howard has been in talks to direct a Disney biopic. This is the creation of French art director Pascal Witaszek who would just love to see director Ron Howard working with Gosling on a chronicle of Disney's rise to fame. This really is a great piece of work, and it has the style of one of Disney's more serious live-action dramas like Remember the Titans or Miracle, not to mention Gosling is perfect to play the man who built the House of Mouse. Aside from the charming aesthetic of the poster, you'll notice that in addition to Howard directing, the artist envisions a script from David Koepp (Jurassic Park) and Akiva Goldsman (I, Robot, Angels & Demons), a frequent Howard collaborator. In addition the cast includes the likes of Michelle Williams, Ewan McGregor, Matthew Fox and Marion Cotillard, but we're not sure if he envisions them playing specific roles in Disney's life or just wants them all in one movie together. Either way, the prospect is exciting and I would love to see a film about Disney come together, whether Gosling is involved or not. How about you? there is nothing wrong with this poster at all, i would love to see a disney biopic and ron howard would it justice. matt fox could be roy disney for sure. After seeing this I realized how little I know about Walt Disney short of all the rumors I've heard. I still can't find a solid consensus as to if he was a Nazi sympathizing bigot or just a brilliant business man with a love for children so a film about his life could be quite eye opening. he wasn't at all, if you know the history & read the books about his life... those rumors have no proof what so ever. Ryan Gosling as Disney? Never. Ron Howard direct it? Never. That's a pretty brilliant poster. I saw this on tumblr and thought it was real and I was soo excited.. Now I find out its fake.. SMH. What is the use of all this "FAKE" stuff? What good is it to get pumped for something that's probably never gonna be made? Sure everyone needs dreams, but it just saddens me that great ideas are never realized and unoriginal films are easily produced and released. Who knows, some Hollywood people will probably see it. If the buzz on the web is right, it will translate into the real world and some reporters might ask Gosling about it, if he has seen it or what he thinks. It gets people talking and thinking. You never know. Besides, it's a pretty neat poster and the artist probably had an awesome time doing it, so he wants to share it. Nothing wrong with that. There are times when someone is cast for a role and you think, "Meh...I would have cast [insert better selection here]." However, in this hypothetical that I'm wishing would happen, I can think of no better person than Gosling. Talk about perfection. I would love to see a movie made about Uncle Walt it's long over due and either Ryan Gosling or David Arquette would be good to play Walt Disney. this poster is sooo good - shame on hollywood for being so anti creative these days, change is good, loose the big heads. Looks like "Dewey" from the Scream movies. Please, please, make this movie! The cast could be modified as needed with the exception of Ryan, who would play the part perfect I am sure. they reallyy should make this movie!! !